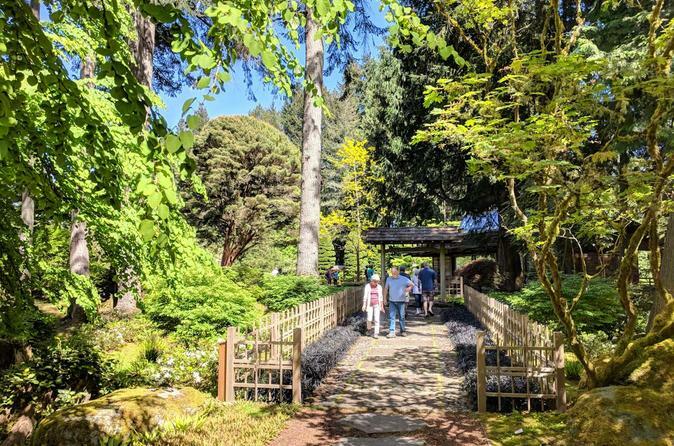 Experience Pacific Northwest island life, history, and wine on this small group day tour of beautiful Bainbridge Island. We’ll start the day with a scenic ferry ride from Seattle followed by a leisurely tour of this island’s colorful past. In the afternoon, it’s all fun as we explore the island’s budding winery scene by visiting three local producers. The tour includes a gourmet lunch, admission fees, winery tasting fees, and pick-up/drop-off at your Seattle hotel in our luxury Mercedes van. Our Bainbridge Island history and wine tour starts with morning pick-up at your hotel in our eight-passenger Mercedes van. We'll board the scenic Bainbridge Island ferry, where we'll enjoy coffee, tea, and pastries while taking in sweeping views of the Seattle skyline and surrounding mountain ranges. The rest of the day is all lighthearted and fun as we explore Bainbridge’s growing wine scene. We’ve carefully curated three island producers for some enjoyable, educational, and unpretentious tastings. After the tastings, there will be an opportunity to explore lovely downtown Bainbridge, filled with shops, galleries, and restaurants. Hotel pick-up/drop-off, ferry fare, park admissions, winery tasting fees, and food and drink are all included. Guests must be 21 years or older with valid identification to participate in wine tasting. Please note that our guides optimize every tour based on the season, weather conditions, and guest interest, so exact itineraries are subject to change.